The Poggi Ugo company, established in 1919, still creates its magnificent terracotta objects, a real symbol of the Impruneta area, with time-honoured manual and artisanal techniques. To celebrate the 100th anniversary of the business, Antonella and Lorenzo Andrei, nephews of the founder, together with curator Valentina Guidi Ottobri, developed the project Land, under the creative direction of Masquespacio, founded in 2010 by Spanish duo Christophe Penasse and Ana Milena Hernández. 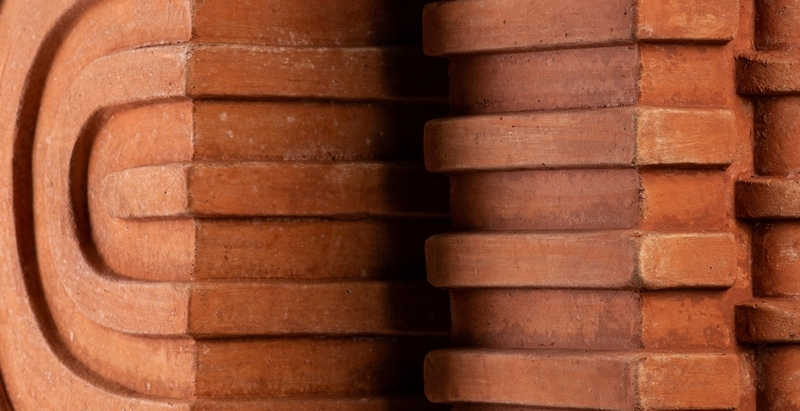 Awarded numerous international prizes, Masquespacio have interpreted terracotta as a refined synthesis of art and nature. Taking inspirations from the past and the present and creating a dialogue between them, Land evokes a new aesthetic vision, a creative example of the contemporary metamorphosis that terracotta goes through when dexterity meets design. The collection of three flower vases, inspired by post-modern architecture, was conceived to animate interior spaces, suggesting an exotic landscape. “The perfect transformation of our projects into objects made by hand, with ancient techniques, is fascinating,” say Christophe and Ana Milena. “We normally work using computers and technology, so the human touch, as well as the artisan’s ability to find creative solutions for every piece, is really inspiring for us.” Passion and precision combine to create vases that are entirely handmade, where the strength of the material meets the aesthetic of architecture.